Do you guys/gals have any critters, big or small, even a snail? I myself (kind of, not really) own two dogs. A basset hound, Piper, and an overweight begel, Payton. 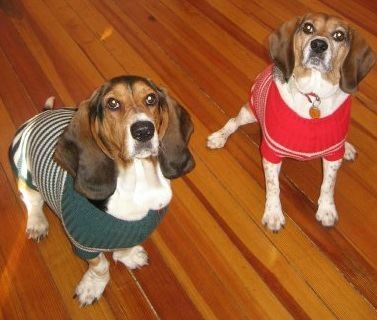 Piper (left) and Payton (right) during Christmas of 2010, I believe. I, too, do not have a pet... HOWEVER if I did, it'd be a rottweiler.